Just How Is Obama NOT An Abject Failure? Under Barry Husseins’ pathetic failure of leadership, 24% of Americans believe that the recession will last 2 years. And another 51% believe that it will last MORE than two years. Given the fact that Obama will only be president for another two years, and given the fact that Obama was elected to fix the economy, what we basically have is a statement from 75% of Americans that Obama will be a completely failed president. Only 13 percent of Americans say Mr. Obama’s economic programs, among them the stimulus package, have helped them personally. Twenty-three percent say they have hurt, while 63 percent say they have had no effect. Now, understand: the stimulus is officially $862 billion, but it’s actual cost according to the Congressional Budget Office will be $3.27 TRILLION. And 87% of the American people say that this beyond supermassive sum of money which will burden our children for decades either had no effect at all or actually HURT them. Now, this $3.27 trillion will surely ultimately be ripped out of the hide of the US economy. It’s only a matter of time. An increase in the money supply is rather like an overdose of drugs. And in this case the effect of the overdose will be hyperinflation. Basically, the moment we have any kind of genuine recovery, our staggering deficit is going to begin to create an ultimately gigantic inflation rate. Why? Because we have massively artificially increased our money supply beyond our ability to actually produce real wealth, and that means that money will ultimately be devalued. There’s simply no way it can’t be. If simply printing money solved financial problems, the government could just mail everyone several million dollars, and we could all retire. The problem is that more money chasing a limited supply of goods simply pushes up prices higher and higher without doing anything to solve the underlying economic problems. If we have a recovery, with increased economic activity, there will be increased demand on the money supply, forcing an upward climb in interest rates as a means of controlling the currency. And then we’ll begin to seriously pay for Obama’s and the Democrat Party’s sins. Paradoxically, the only thing preventing hyperinflation now is the recession, because people aren’t buying anything and therefore aren’t competing for those limited goods. That said, there is solid evidence that the stimulus actually HURT THE ECONOMY AND EMPLOYMENT IN THE RIGHT-HERE-AND-NOW by sucking money out of the private sector where it would have been put to good use and instead funneling it through the government were it was pissed away on political boondoggles and bureaucratic inefficiencies. The evidence is clear: the governments that did not pass huge stimulus packages have fared much better than those like the US which did. A further fact in our economic and political collapse is that Obama is creating a permanent elite class of government bureaucrats. USA Today found that “At a time when workers’ pay and benefits have stagnated, federal employees’ average compensation has grown to more than double what private sector workers earn.” Obama has massively expanded government, even as the the real pie for everyone (the economy) has been shrinking. Since government workers don’t actually create wealth, but merely live off the taxes paid by those who create wealth, and since there are more and more government workers and fewer and fewer private sector workers, we’re heading for a real problem. Again, “paradoxically” is a good word, as paradoxically Obama is creating a ruling class over the people who consume the peoples’ wealth in the name of helping the people. A majority of Americans have a negative impression of the economy and expect the effects of the recession to linger for years, according to a new CBS News poll. Most also say President Obama has spent too little time on the economy, which Americans cite as the country’s most important problem by a wide margin. Three in four Americans now say the effects of the recession will last another two years or more. More than eight in 10 say the condition of the economy is bad, up five points from last month. Just 25 percent of Americans say the economy is getting better – down from 41 percent in April. About half say it is staying the same, and the remaining quarter say it is getting worse. More than half of Americans – 52 percent – say Mr. Obama has spent too little time dealing with the economy. And with unemployment near 10 percent, the economy is their priority: Thirty-eight percent volunteer it as the country’s most important problem. That far outpaces the percentage that cited the wars in Iraq or Afghanistan (seven percent), health care (six percent), the deficit (five percent), and the oil spill in the Gulf (five percent). The county’s most important economic problem, Americans say, is jobs, volunteered by 38 percent of respondents. Coming in a distant second was the national debt, the deficit and spending, cited by 10 percent in the poll, which was conducted between July 9th and 12th. Just 27 percent of Americans say their local job market is good. Seventy-one percent call it bad. Nearly one in four expect their household finances to get worse over the next year, twice the percentage that expects their finances to improve. Twenty-three percent say the stimulus package made the economy better – down from 32 percent in April and 36 percent last September. Eighteen percent say the stimulus package damaged the economy, while 56 percent say it had no effect. The president’s job approval rating on the economy now stands at 40 percent – a drop of five points from last month. Fifty-four percent disapprove of his handling of the issue. In general, Americans see Mr. Obama as spending too little time on the economy and the oil spill in the Gulf, and too much time on health care: Thirty-nine percent say he has spent too much time on the issue, while 24 percent say he spent too little time. Americans do believe the president takes decisive action, with two and three suggesting he does. But more than half (53 percent) say he is not tough enough in his approach. Americans are evenly split, meanwhile, on whether the president shares their priorities. Two in three believe he cares at least to some degree about people like them. The president’s overall approval rating now stands at 44 percent, matching his disapproval rating. It stood at 47 percent last month. Most Americans – 53 percent – say the best way to get the economy moving is to cut taxes. Thirty-seven percent instead choose government spending on job creation. Americans are split about how the federal government should spend its money: Forty-six percent say the priority should be spending to create jobs, and 47 percent want to put the focus on deficit reduction. More than half want Congress to extend unemployment benefits now, a Democratic priority that has been blocked by Congressional Republicans. Support for Arizona’s controversial immigration measure has increased: Fifty-seven percent say the law is “about right,” up five points from May. Just 23 percent say the law goes too far, while 17 percent say it doesn’t go far enough. More than half say states should be allowed to pass illegal immigration laws, while 42 percent say only the federal government should have that power. Americans are somewhat split on the impact of illegal immigrants: 42 percent say they take jobs away from Americans, while more – 50 percent – say they take jobs Americans don’t want. Americans still largely disapprove more than they approve of Mr. Obama’s sweeping health care reforms. Forty-nine percent of Americans disapprove of the health reform legislation, while 36 percent support the law. Support has dropped seven points since May. Americans are roughly evenly split on whether BP will stop the flow of oil in the Gulf of Mexico by the end of the summer. Most (58 percent) are not confident that the company will fairly compensate those affected by the spill. With Democrats poised to pass sweeping reforms of Wall Street this week, a majority (57 percent) say bank regulations should be increased. Sixty-two percent of Americans say things are going badly for the United States in Afghanistan, up from 49 percent in May. Just 31 percent say things are going well. In Iraq, 55 percent say things are going well, while 28 percent say things are going badly. Most Americans favor a timetable for withdrawing troops from Afghanistan. Fifty-four percent back a timetable, while 41 percent oppose one. Mr. Obama has said the United States will start removing troops from the country in July of next year, but only if conditions on the ground permit. Most Americans can’t say whether Supreme Court nominee Elena Kagan should be confirmed. Among those who have an opinion, 21 percent say yes and 19 percent say no. Less than half say they are closely following news about her nomination. Despite their concerns about the economy, Americans do not believe their country is on the decline. Fifty-nine percent expect things to get better in the long run, while 36 percent say America’s best days have passed. This poll was conducted among a random sample of 966 adults nationwide, interviewed by telephone July 9-12, 2010. Phone numbers were dialed from random digit dial samples of both standard land-line and cell phones. The error due to sampling for results based on the entire sample could be plus or minus three percentage points. The error for subgroups is higher. This article was written in July. And it is amazing how far we have fallen since those days only a little over the month ago (that was back when Obama was pitching his pseudo “summer of economic recovery, donchaknow). Now here we are, with Obama’s failures being revealed to be even MORE magnificent, as the jobless claims rise to their highest levels in 9 months (with over half a million new filings). The layoffs add to growing fears that the economic recovery is slowing and the country could slip back into a recession. There’s your double-dip recession for you. And that recession belongs entirely to Obama and the Democrat Party, which are leading us toward complete ruination. All Obama has going for him are false blame on Bush to explain his two-years’ worth of abject failure and outright lies, such as his recent one taking credit for a stimulus dollar success when the stimulus didn’t have anything to do with the project Obama cited. For the record, Obama has been lying about employment all along. With $862 billion dollars you’d think Obama could find at least one actual success. But the porkulus was THAT bad; there weren’t any. Some other things that the poll didn’t mention: a solid majority of Americans now believe that their president is a socialist (as people like me were saying all along). If all of this doesn’t represent a massive failure of leadership, precipitating a failure of trust which itself creates massive economic suffering, please tell me how it isn’t. You wouldn’t mind if I took $862 billion dollars of your money – actually $3.27 TRILLION if truth be told – and totally pissed it away, would you? No, you don’t mind? Good. That’s a relief. I mean, a lot of people would be a little upset that I’d bankrupted the country and ended up with absolutely nothing to show for it. Obama, the White House, and the Democrats told massive and outrageous lie after massive outrageous lie to sell their load of porkulus crap. But the American people didn’t believe it: a poll by the New York Times and CBS revealed that only 6% of Americans believed that the Obama stimulus created any jobs at all. NEW YORK (CNNMoney.com) — The recovery is picking up steam as employers boost payrolls, but economists think the government’s stimulus package and jobs bill had little to do with the rebound, according to a survey released Monday. In latest quarterly survey by the National Association for Business Economics, the index that measures employment showed job growth for the first time in two years — but a majority of respondents felt the fiscal stimulus had no impact. NABE conducted the study by polling 68 of its members who work in economic roles at private-sector firms. About 73% of those surveyed said employment at their company is neither higher nor lower as a result of the $787 billion Recovery Act, which the White House’s Council of Economic Advisers says is on track to create or save 3.5 million jobs by the end of the year. But the economists see conditions improving. More than half of respondents — 57% — say industrial demand is rising, while just 6% see it declining. A growing number also said their firms are increasing spending and profit margins are widening. Nearly a quarter of those surveyed forecast that gross domestic product, the broadest measure of economic activity, will grow more than 3% in 2010, and 70% of NABE’s respondents expect it to grow more than 2%. The Democrat argument is that the economy is doing better; ergo sum the stimulus worked. The problem is that that’s rather like saying that the economy is doing better; ergo sum the fact that I had a good bowel movement worked. There’s simply no reason to correlate the one thing with the other. I would also ask this: name the recession that lasted forever. The closest we can come is the Great Depression under FDR. His failed policies prolonged the depression and a lot of needless suffering for seven years. The other thing I would say is that we are by no means out of the recession that we are in. There is still abundant evidence to believe that we may very well be headed into a double dip recession – with Obama’s failed policies being completely responsible for that second dip. Long term, I believe that Obama has doomed this country. If we can’t undo the damage caused by his ObamaCare boondoggle before it begins to seriously take effect, I think it will amount to the anvil that broke the camel’s back. And even if we CAN undo ObamaCare, the massive debt this president has imposed on us due to his now demonstrably failed policies will be like a cancer that will eat away at our way of life. It is possible that there may be a jobless recovery. But Obama slit the hamstrings of the recovery we COULD have had when he pissed away what will ultimately cost us more than three trillion dollars. That money – which didn’t create any jobs – is going to consume jobs by way of opportunity costs. Businesses COULD have used that money to grow and hire; but instead Obama seized it, and poured it down the drain. And now we get to experience the joys of the gift that keeps on giving as we pay billions of dollars in interest payments, which is money that again COULD have been used to create jobs but never will. Whether the economy looks a little better or a lot worse than it did, we will not even possibly be able to grow under the massive debt load that Obama has forced upon us with his massively failed stimulus. We need to hold him accountable for his failure, or he will continue to stockpile one disaster on top of another. Senator Evan Bayh apparently finally had a bellyfull of the Democrats steering the ship of state full speed ahead straight into a giant iceberg. Bayh described a scenario of brain-dead politics and hyper-partisanship. But this promise leads, inevitably, to a question: Can such a majority be built and led by Mr. Obama, whose voting record was, by one ranking, the most liberal in the Senate last year? And I remembered pointing out that Obama’s promise to transcend ideology and partisanship was his signature lie. And I remembered that Obama is now recognized to be the most polarizing president in history. And what followed from that point was a far leftwing agenda being shoved down Republicans’ throats without any attempt to win their votes via compromise. The reasoning was that Democrats had total control of the House to go along with a filibuster-proof majority in the Senate. Republicans were shut out of crucial negotiations. And they were shut out as a general rule. They did not get to have anything to do with writing the bills that they were told they had to vote for in order to be “bipartisan.” They didn’t even get to READ bills with enormous ramifications before the votes. The Democrats constantly did their business behind closed doors. Even their meetings on “transparency” were done behind closed doors. It wasn’t just Republicans. The liberal Democrats were so partisan and so secretive that even the moderate blue dog Democrats found themselves shut out of ObamaCare negotiations. Obama would flood the airwaves with message after message about transparency and about reaching out to Republicans with a bipartisan spirit of cooperation. But what he says has a bad habit of not jiving with what he does. The Republicans had been submitting bills to Obama all along. Which means that every single time he characterized them as “the party of no” who weren’t contributing their own ideas to the debate, he was knowingly cravenly and despicably lying. The only thing that is “bipartisan” now is that Democrat and Republican alike have no reason to trust Obama. Obama promised again and again that he would transcend the political divide. That was HIS promise, not the Republican minorities’ promise. It was Obama who broke his word. And it is Obama who should be held accountable to his broken promise. All that garbage wasn’t the Republicans’ fault. It was Obama’s and the Democrat leaderships’ fault. So that’s one giant liberal lie put to bed. 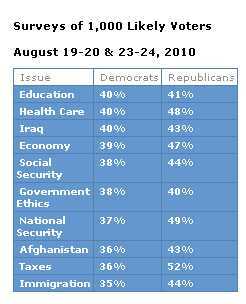 Barack Obama and the Democrats in Congress couldn’t have been more hyperpartisan or more ideological. The Republicans were right to oppose their agenda. And the polls of American voters that have radically swung in their favor prove it. The second giant liberal lie that Evan Bayh put the kibosh on is the myth that the stimulus has somehow been a giant success in spite of the fact that it was a giant failure even by the Obama administration’s own standard. Obama’s key economic advisers assured us that the stimulus would prevent unemployment from reaching 8%. Unemployment has soared past that 8% figure – and according to Obama’s own projections joblessness will be well over 8% until at least 2012. Obama and his minions have repeatedly made spectacular claims about the “success” of the stimulus that fly in the face of reality. According to Obama’s own Recovery.gov website, by the White House’s own numbers, Obama only claim 595,263 jobs that were at a cost of $272 billion. That comes out to an astronomical $456,941 per job. And at that rate, we can’t AFFORD for Obama to “create” any more jobs. Democrat Senator Evan Bayh, a former governor who presumably knows something about job creation, absolutely destroyed the myth of any kind of stimulus success. The number of lies that have been told about the Obama stimulus have been utterly breathtaking. And the American people who’ve clearly heard at least one too many lies from Obama agree with Evan Bayh. According to a New York Times/CBS poll, a whopping 94% of the American people agree with Bayh. Only 6% of Americans believe Obama’s massive porkulus has created jobs a full year after going into effect. Only SIX PERCENT of Americans believe that Obama’s porkulus has created any jobs at all. That means more Americans believe that space aliens have anally probed them than believe in the stimulus. It also means that 94% think Obama and his entire administration and the entire Democrat congressional leadership are completely full of crap. And 48% of Americans polled don’t think porkulus will EVER create jobs. All that nothingness for the low, low price tag of only $862 billion. As we head into the future, we find that the Democrats are still playing games rather than dealing fairly and squarely with legislation. Democrats are still demagoguing, misrepresenting, and lying. And until they quit – or until they are voted out – Republicans would be wise to avoid them and refuse to play around with them.